On a Sunday in early May, Atlanta had a third rain shower in a week, one predicted to last all afternoon. I recall hearing a powerful, small-voiced thought: ‘what a good day to edit a book!’ As the rain pattered the ground sounding like hands dancing on a rattling keyboard, I enjoyed both my editing experience, as well as the gifts and inspiration from the book. No one could have predicted the upcoming weather that dumped rain almost daily. In that time, editing projects drizzled, then flooded, onto my desk. By mid-August, I will have edited ten books. These projects are in various stages of completion from early drafts needing content editing to final drafts for line edits. One project required both simultaneously. I’ve seen several projects for different views just weeks apart. The authors are mostly new to full book length. One is working on a series with two books ready for publication. Another makes a living as a writer. All are passionately exploring creative expression and driven to write in memoir, fiction, historical nonfiction, humor, inspirational, self-help, and even paly format for the stage. Meanwhile, I continue to guide a dozen more writers pursuing the completion of their first drafts, as well as a few more on content for marketing and blog purposes. Some meet with me, whereas others communicate via email, phone and Skype. When it rains again, take its cue — stomp in the puddles of your ideas and dance in the downpour of those small-voiced wishes from your soul. Experience the exhilaration of acting on them. 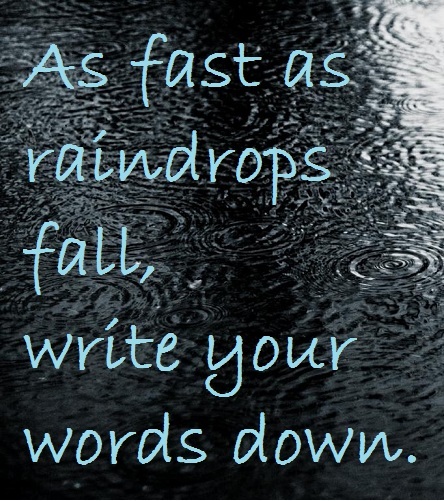 As fast as raindrops fall, get your words down. 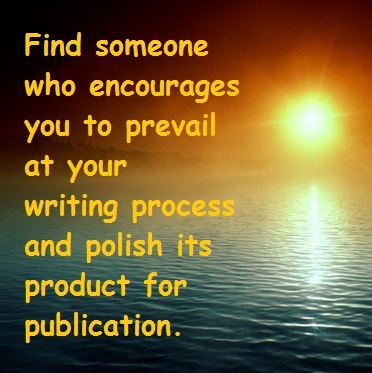 And find someone who encourages you to prevail at your process and polish its product for publication. Stay tuned for announcements on the newly published authors. And join in the fun with your project! Just out of college, he had never written a book before, much less hired an editor. He asked for help from a few friends and his mom, but they didn’t want to hurt his feelings or find flaws with his work. He needed a professional who didn’t know him to do a thorough cleanup and polish. Retired with several degrees including a Ph.D., she had been working on her first book on and off for a decade. She wanted guidance to improve her story and grow her skills. Both authors wrote memoir leaning toward inspirational/self-help, genres in which I have experience. He found me through a Google search, which included the word ‘memoir,’ and queried over a dozen editors about pricing, approach and availability. Living in the northeast, our correspondence began via email. I met her at a writing conference for inspirational nonfiction, and we hit it off, respectfully sharing experiences while exchanging ideas. Though similar to other editors, he liked the tone and content of what I wrote, felt he’d found the ‘right person for the job.’ I suggested he contract me to edit a couple of chapters to determine if we worked well together. Next, we agreed on a schedule for delivery of sections and payment, then he sent his manuscript. We exchanged honest, detailed emails throughout the process. During our initial conversation, I shared a challenging idea to write an additional chapter to bring the reader closer to the driving conflict of her story. She balked, but promised to consider it. The next morning, she found me in the conference crowd and hired me. After returning to her home a few states from my own, she sent her manuscript via email. The role of an ‘editor,’ even the title itself, has variables. 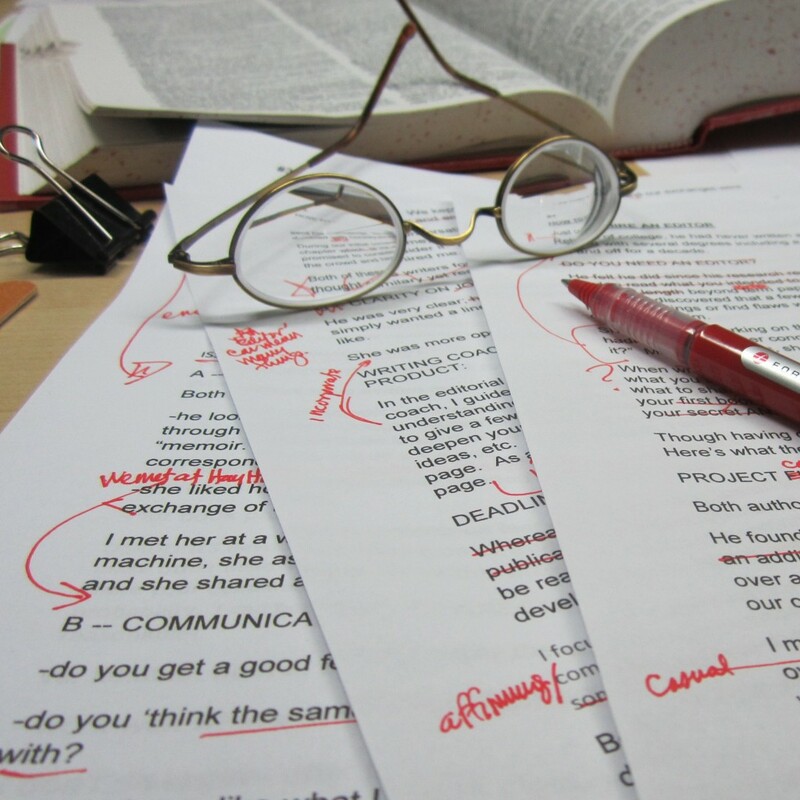 He was very clear; he simply wanted a line edit to check grammar, sentence structure, punctuation and the like. In the editorial role I fulfilled for him, I polished and worked with the words on the page. She was open and prepared to explore both process and product. I coached her toward stronger setting, characters, point of view, etc., as well as how to consider audience while staying true to her vision. I posed questions to encourage her to broaden and deepen the story. I also supported her when she hit tough spots. We began a journey that would have different stages before a final edit. Focusing on efficiency and timeliness, I schedule work when it lands on my desk, affirming my proposed return. He had a set deadline coinciding with a specific anniversary date. Her project required content development in stages, and soon expanded into a series. Both of these projects – his line edit and notes for her first revision — were completed on deadline in 5 working days. Every writer has different issues to solve and needs a unique approach. Like a combination physician-detective-mechanic-wizard, I have my methods, but my biggest gift is to listen to the client, discern what they want and need, then communicate well through spoken and written words to inspire the writer to achieve stated goals. He was pleased with the final result and also thanked me for increased confidence through our work. She expressed gratitude as well, and as we continue to work together on two books simultaneously, her self-assurance and strengthened voice reflects in the process, as well as her writing. As if Frankenstein himself is busting down the door, many writers are freaked slap out by the deadline. The writer will cower and bargain with the monster, begging for more time to explore and re-work. Any argument tempts nature like a rooftop experiment in an electrical storm ultimately making the writer feel crazy-mad, defeated and, well, Abby Normal. The enraged, unsympathetic beast snatches the writing anyway, then escapes deep into the inky night. The newspaper industry adopted this powerful language to have the latest news printed and distributed in a timely manner. Editors’ deadlines implied “If you don’t submit your writing on time, printing presses will roll, and your story is dead.” Consequently, so was your career. When I work with editorial deadlines, I prefer to avoid last minute pressure by setting a personal deadline about three days in advance of the real one. In most cases, I am able to submit my copy ahead of deadline. This gives the client extra time, plus it demonstrates a strong work ethic which brings more assignments to my desk. So what if you don’t have an editorial deadline or a gun pointed at your head? You can hire a monster (i.e. me, minus green makeup and bolts in my neck), or you can be creative and do it on your own. Karen wrote consistently as a member of my Creative Writers Workshop, but struggled to finish a story. In conjunction with private coaching, she decided to try using a contest deadline as motivation. The word count added more limitation, yet provided her with a crash course in sharper revision and final editing. She hit the word count with characters to spare and the deadline on target. Kirby protects her scheduled writing times on Mondays, Wednesdays, and Fridays. To complete and publish her book, she set a firm November deadline so she could have books printed by early December. She factored in time for her completion, my editing and the printer’s process. Even with snags, all ended well with her wrapping up books as gifts for the holidays. Cammie quickly discovered the necessity to schedule coaching sessions every other Saturday with a deadline of Wednesday midnight to get her work to me for meeting prep. Using this system, she completed her ambitious project, a major feat considering she had not written beyond undergrad projects, much less 128 polished pages in a new genre. Basically, the deadline is a commitment to an amount of time, a certain number of words written, or a project completion date. Your editor, printer, writing group and coach are counting on you, so count on yourself. Meet your goal. If you want to be a successful writer, make nice with the misunderstood monster. 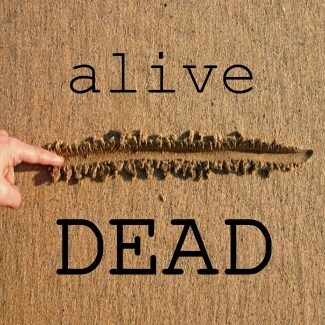 If the term ‘deadline’ frightens you, change it. Use ‘goal,’ ‘aim,’ ‘target,’ or ‘destination,’ whatever feels good to you. Embrace the deadline’s positive influence as a vital partner in the dance to complete your writing project. Affirm: My deadline is a positive motivator. I do my best work, and I celebrate meeting my deadlines, the final one, as well as every small step along the way. So, the dance is over. What do you do After The Deadline? 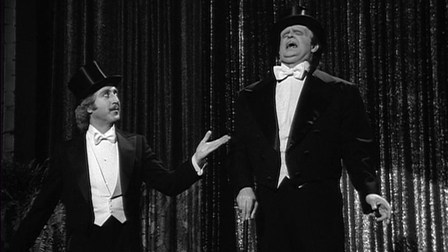 Images: Frankenstein (1931) with Colin Clive and Boris Karloff; Young Frankenstein (1974) with Gene Wilder and Peter Boyle.